Not one to be left behind in the dust, Porsche has been hard at work perfecting their hybrid design. They’ve listened to customers’ needs and are committed to delivering vehicles that bring the same Porsche standards to a new way of driving and protecting the environment. That’s why the new Porsche Panamera will be the Panamera 4 E-Hybrid. You won’t see it at your Palm Beach Porsche dealer just yet, though. The 4 E-Hybrid wasn’t even unveiled until the Paris Motor Show this past month. 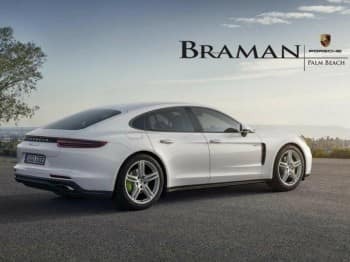 But this particular new Porsche Panamera will be the fourth in that lineup and is reported to have an all-electric range of about 31 miles. However, these numbers might change due to varying standards between the EU and United States. Still, as it is a hybrid, if you need the extra boost that gasoline can provide, that’s always an option. It still maintains that same Porsche look, so there’s no sacrificing in terms of size or design to accommodate for the hybrid concept. You can still fully enjoy what Porsche has to bring to the table, which, if you’ve ever even tested one at your Palm Beach Porsche dealer, you know is a lot. The drivetrain is built around a twin-turbocharged 2.9-liter V6 engine. Working together with an electric motor and a liquid-cooled 14.1kWh battery pack mounted below the trunk floor, you can get a total output of 462 hp and 516 lb-ft of torque. You’ll be going from 0-62 mph in just 4.6 seconds. Of course, because this is Porsche we’re talking about, you can also expect numerous packages, such as Hybrid Auto, Sports Chrono, E-Power, and more, as well as a ton of to-be-expected Porsche accessories. Until the new Porsche Panamera comes to the States sometime in 2017, find out what’s available right now at your Palm Beach Porsche dealer.